How It’s New York: With events at both 92Y and Symphony Space this week, the Booker-prize winning author Anne Enright is reading at some of the City’s top venues for literature. Easy access to the best writers in the world–that’s so New York! 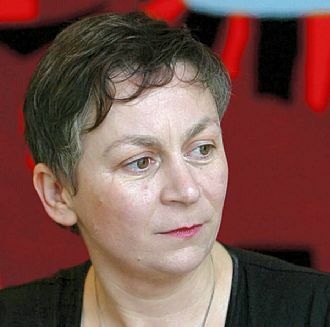 How It’s Irish: Anne Enright was born in Dublin, Ireland, and is on tour in the U.S. to promote her recent work The Forgotten Waltz as part of Imagine Ireland, Culture Ireland’s year of Irish arts in America. We have a pair of tickets to giveaway, email us at newyorkirisharts@gmail.com to claim them! introduced by Imagine Ireland Literary Curator Belinda McKeon. Solace: A Novel doing quite well in Ireland (read our review here!) and the U.S., humbly noted that, “Anne is a writer we other Irish writers envy.” She doesn’t write of Ireland in the vein of “cream cakes and tea,” but as a modern country with modern issues. Belinda’s introduction was pitch perfect, mixing a little bit of humor and poetic “cheekiness” that prepared the audience for the reading selection to come. Ms. Enright prefaced her reading by suggesting that story in The Forgotten Waltz can be explained in three ways: as a story about a woman who falls in love; a story about a woman who falls hopelessly in love, for that’s the only kind there is; or a story about a woman who is an adulteress, a man-stealer, a home-wrecker, a liar, and worse. But Enright is quite funny, both in her prose and in person, and handles the last, more daunting part of this story with a deft and honest eye toward the things that make us tick. She is an enjoyable reader to hear aloud and her language, moderately sparse and beautiful, captivated the audience. Even in the short sections chosen by the author, one begins to feel a connection to her heroine, Gina Moynihan, and a desire to find out how this woman, “the younger woman” but no longer actually a younger woman, will manage happiness. You’ve got another chance to catch her while she’s here: Enright also appears Wednesday, October 5 at the Thalia Book Club at Symphony Space, in association with Glucksman Ireland House New York University, at 7:30 pm. One of the defining traits of Thalia Book Club is hearing actors read the words. Amy Ryan (I know her as Michael’s love Holly in “The Office,” but she’s also an Academy Award-nominee for Gone, Baby, Gone). According to her wikipedia page, she’s partly of Irish descent, and attended Stagedoor Manor. I love that that detail is on her page. Hannah Tinti (Editor of One-Story Magazine) will interview.